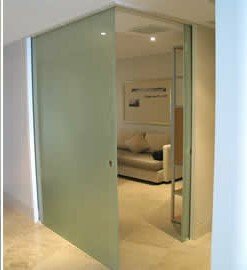 PREMIUM SLIDING DOORS IS DESIGNED TO DIVIDE AMBIANCES THROUGH FRAMELESS GLASS SLIDING DOOR(S) WITH A RECESSED OR EXPOSED TRACK IN COMMERCIAL AS WELL AS RESIDENTIAL PROJECTS. Ideal for entrances into bedrooms, lounges, bathrooms, offices, etc. Minimalist design with exposed or recessed hardware holding panels up to 3m high. Clean opening free of floor tracks. Glass panels held through high weight capacity pressure clamps (use of tempered or laminated glass). Use of 8mm 14mm glass panels for doors up to 120kg. Soft close system for quiet and soft opening.